An enthalpy change is approximately equal to the difference between the energy used to break bonds in a chemical reaction and the energy gained by the formation of new chemical bonds in the reaction. It describes the energy change of a system at constant pressure. Enthalpy change is denoted by ΔH. At constant pressure, ΔH equals the internal energy of the system added to the pressure-volume work done by the system on its surroundings. For an endothermic reaction, ΔH is a positive value. For an exothermic reaction, ΔH has a negative value. This is because heat (thermal energy) is absorbed by the endothermic reaction, while it is released by the exothermic reaction. 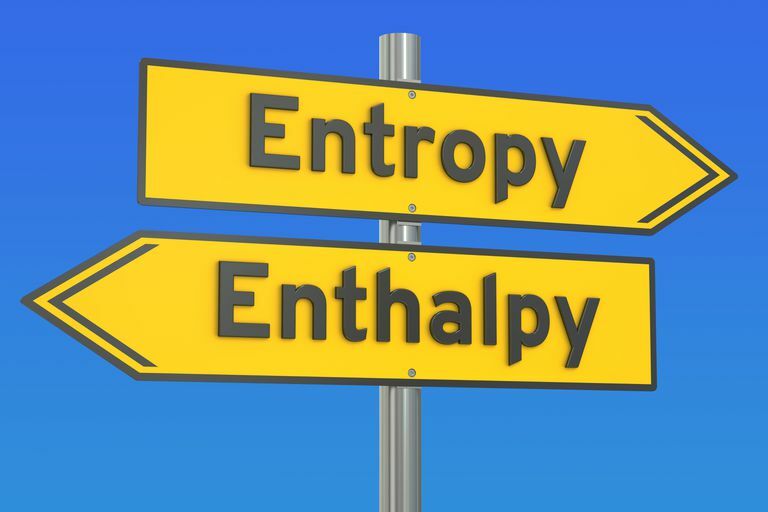 Enthalpy change and entropy are related concepts. Entropy is a measure of the disorder or randomness of a system. In an exothermic reaction, the entropy of the surroundings increases. As heat is evolved, the energy imparted to the system increases disorder. In an endothermic reaction, the external entropy decreases. As heat is absorbed by a process or reaction, the kinetic energy of molecules in the surroundings decreases, which tends to reduce reduce disorder.